The philosophy of Beach People is quite simple. They are a gentle folk who have stories to tell. They have been at sea for a long time, sometimes for years, before finding their way to a shore. They have seen the condition of the seas and shorelines. The general theme of their stories is to remind us that the beaches and oceans have been entrusted to us for as long as we are here and it is our responsibility to keep our beaches and oceans clean so we may pass the responsibility to those who follow. 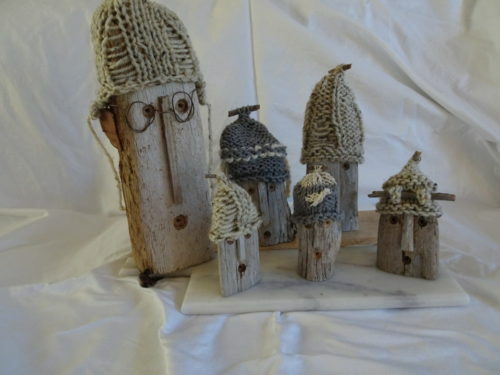 My Beach People are made from local driftwood. Other materials used are wood glue, wire, smallscrews. The hats are made from yarn (wool, cotton, synthetic), string, cording and sticks. They are knitted to fit the heads. The eyes and mouth are drilled into place. The glasses are hand bent to fit the face. The noses and ears are chiseled and sanded to fit the face.